If you play racquetball at all, whether infrequently or several times a week, you must wear the best racquetball goggles to play in. Getting a ball to the eye at the speed they travel could lead to serious injury. The importance of wearing racquetball goggles cannot be overstated so regardless of if they offend your fashion sense, you got to at least try to wear them every time you step out on court. This is true for all players but especially in the professional ranks. To play in a tournament you are legally required to wear a pair of racquetball goggles and there are strict guidelines on their design and features. Goggles are a relatively simple and cheap piece of equipment to pick up so there is no excuse not to do so. 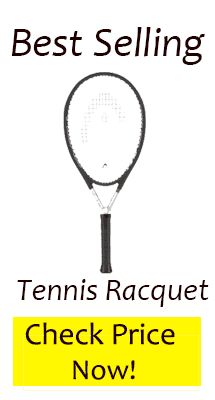 Generally, racquetball goggles come in two different styles – two-piece lens goggles or one piece lens goggles. The two-piece sort have two lenses like normal sunglasses and tend to look more stylish when on. They can however give less protection to your face and eyes doe to the smaller profile they give. One piece goggles have only one big lens in them that covers both eyes. These aren’t as good looking and can be harder to wear but do offer better protection along with more peripheral vision than the two piece. Racquetball goggles are essential for player safety on the court. They’re inexpensive and can save you from eye injuries while playing. One of the biggest problems people have with wearing the goggles is that they fog up during play. This obviously leads to loss of vision and being able to compete properly. 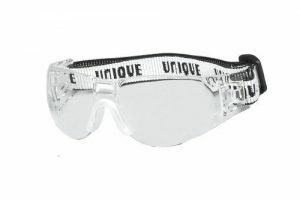 It is best to get a pair of goggles with an anti-fog coating put on them during production. This ant-fog coating will eliminate this problem and mean you don’t have to constantly be stopping to clean your goggles or lose any points mid-game. The only problem with anti-fog coating is that it will wear off over time which is why the newer goggles coming out now have vented lenses as well. One of the major rules in racquetball is that you automatically lose the rally if your goggles fall off onto the court floor. As unlikely as this may sound, it can happen if they slip off your sweaty face or you catch them with your racquet. With this in mind, you may want to buy a pair of goggles that have an elastic strap attached to them. This extra feature gives you the peace of mind that, even if they should get knocked off your face in play. Most manufacturers will have goggles with this feature now so is quite easy to find a pair with it. More and more manufacturers now have incorporated this feature into their best racquetball goggles and it is a positive one. By having adjustable side arms, you can move them to fit your face exactly which makes them more comfortable. It really does make the game more enjoyable to play and the goggles better to wear. Easy to switch lenses can make playing in every condition easy and keep your lenses nice for longer. You may want to consider getting a pair that allow you to swap lenses easily. Once you have had yours for a while, the lenses may naturally get scratched through wear and tear. If this is the case it’s handy to be able to change the lenses rather than having to buy totally new racquetball goggles. As all of us have different size and shape faces, it is important to choose goggles that fit your individual face properly. You will spend a lot of time wearing them if you intend to play racquetball regularly, so make sure they feel good when on. This is a great piece of equipment from HEAD and one that will keep you safe out on court in style. The funky looking lightweight frame is durable and will stand up to many hours of use. They boast spherical shaped, distortion free, polycarbonate lenses for added visibility and vision. As with all the best racquetball goggles, they come with an anti-fog coating to stop them becoming misty during games which is vital. The lenses are also anti-scratch so will last longer and avoid you having to replace them after a short while. The non-slip PVC nosepiece is comfortable as are the goggles themselves. The adjustable template and elastic strap keep them firmly on your face or around your neck if they do get knocked off. Coming with a high-quality lens cleaning bag, this is a great piece of equipment to protect you during play. A very popular choice for many, these goggles from Ektelon give fantastic protection and come with some great features. Their interchangeable lens system is a nice touch as means you can just put a new lens in if needs be rather than buying a whole new pair. The nylon frame design is strong yet lightweight and well-designed. Coming with a new curved side arm construction, they are very comfortable and fit well onto your face. All lenses that come with these goggles are anti-fog and anti-scratch to give maximum playability and lifespan. A headstrap is also included to make sure they stay on your face and won’t fall on the court floor if they do come loose. 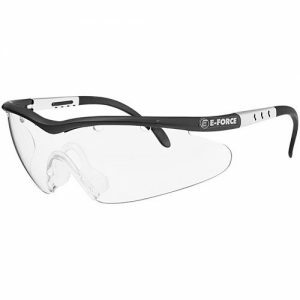 The E Force Crystal Wrap Racquetball Eyewear goggles offer a super lightweight design and classical style. These are one piece lens type goggles and so offer the wrap around look some players prefer as it gives extra coverage to your face. The vented one piece lens offers clearer peripheral vision as well as helping stop the lenses fog up in play. Also included is two different nose pieces to allow you to get a customised fit for maximum comfort. Meeting USRA and ASTM standards, these goggles give unrivaled safety with superb playability. They feel great on and allow you to move around the court with amazing clarity and vision. These racquetball goggles are one of the least expensive we’ve seen. That means they’re good for those on a budget or the more infrequent player who doesn’t want to spend a lot. Accolades in equipment don’t come much higher in racquetball than being officially endorsed by the USRA and this is just what these goggles are. As such you can be safe in the knowledge they offer superb protection and vision. These best racquetball goggles also meet ASTM impact standards so you can be sure it is durable enough to do the job. The view they give is fantastic, offering a full panorama of the court with no distortion in your vision. Coming with an adjustable strap, they will stay on your face securely when playing to protect your eyes fully. Also included is a flow through ventilation system to top the goggles from fogging up which is a great touch. They also have anti-scratch lenses to avoid any issues with having to replace them due to damage. They also fit quite closely to your face which means, for all the good the ventilation flow system is, you can still get some fogging. At just over $10 though, they are a great deal in terms of price. These entry-level racquetball goggles come in under $10 so are by far the least expensive pair we have looked at. This is great if you don’t want to spend a huge amount or are on a tight budget. They come with anti-fog and anti-scratch lenses to avoid them steaming up as well as giving them greater longevity. Loaded with a fully adjustable headstrap, they are comfortable to wear as well as giving a personal fit. The view they give of the court is good and will allow you to move around the court and see the ball freely. Easy to clean and look after, these are a great choice for the new player to the sport. Although they come with an anti-fog coating, they do have a habit of steaming up quite quickly in play meaning you have to clean them quite frequently. These googles are the two-piece lens type so be sure to take that into consideration when you consider what style of goggles to get. Choosing a sturdy, strong pair of racquetball goggles to keep you safe is an absolute must if you play the game in any shape or form. Don’t think because you’re not a professional, you don’t need a pair. The reality is you do and not wearing them risks serious injury. Any of the goggles on our list above are a great choice to keep you safe and help you enjoy the sport of racquetball. So, pick up a pair today and get out there! best prescription protective raquetball goggles? Hmm, there are a decent amount of options. I’ve had some friends I play with go to Sport Rx who specialize in prescription lenses for various sport goggles. Looking at some of the goggles, I personally like the ProGear Eyeguard with a strap (https://www.sportrx.com/progear-eyeguard-s-strap.html). I think straps on racquetball goggles are necessary with the amount of movement in the game.